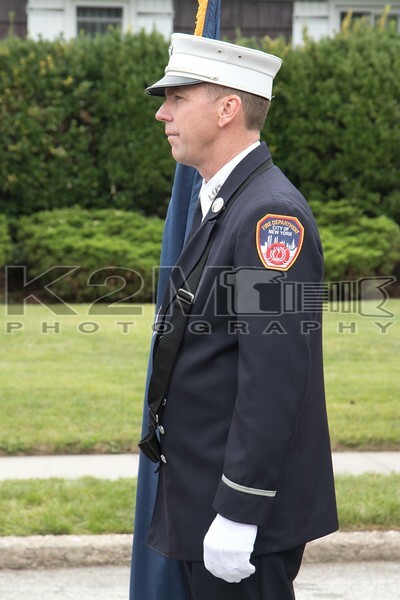 On the morning of Saturday, September 16th, 2017 a street renaming ceremony was held for FDNY and Bethpage Firefighter William Tolley who was killed the line of duty on April 20th, 2017 while operating at a second alarm fire in Queens. The ceremony was held at the intersection of Acme and Crestline Avenues in Bethpage – just a short distance from where the Tolley Family lives. Many firefighters along with family, friends, and dignitaries were on hand for the event which was followed up by a smaller dedication ceremony at Bethpage Fire Headquarters. The smaller ceremony, for an attached lounge area nicknamed “Tolley’s Tavern”, featured a ribbon cutting ceremony by Billy’s wife and daughter. Once the ribbon was cut guests on hand got their first look inside the new addition which will ensure the Tolley name lives on.